Jake's first time in the ocean. Drew still remembers from last time we were out here. Drew and his friend Cypress went snorkling at Sombrero Light; they saw a baby Green Sea Turtle (not pictured) and a lot for fish. Coral Castle is a small castle built by one scrawny latvian in the '30s using only hand-built hand tools. The "castle" itself is a 2-story, 2-room tower in one corner. The rest is mostly a walled garden, all hewn from coral excavated onsite. Tables, chairs, fountains, and lots of bougainvilla. Jungle Island is a zoological park with a focus on tropics / jungle environments. 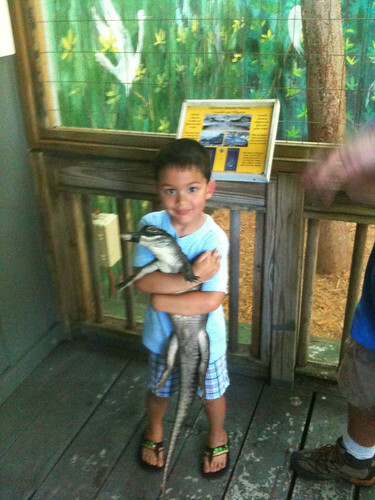 They had LOTS of birds, a few monkeys, some reptiles, gators, and an "everglades" exhibit with lots of fish, birds, turtles, etc. Food stations everywhere, and you can hand-feed most of the birds. In general the animals were amazingly tolerant of the kids, and certainly liked the food we had. Monkey Jungle was awesome. It's a 30-acre compound out among a bunch of mango and cane fields. Inside this compound is a long, fenced-in/over path with a handful of monkey and bird exhibits (plus a pair of rhinocerous iguanas). For the most part it's a few hundred crab-eating macaque and another few hundred squirrel monkeys, plus a handful of small exhibits. As with Jungle Island, we can feed almost everything here. Little boxes of raisins and cranberries are for sale at the gift shop, and there are gumball machines with fish food, sunflower seeds, etc around the park. However, these monkeys are NOT tame, and are fed via hanging cups, or long PVC tubes (for the caged exhibits). The monkeys have figured out how to "request" treats.